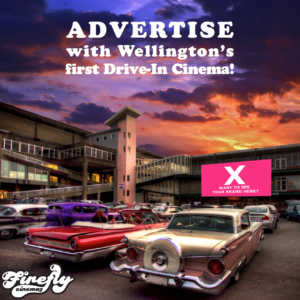 Firefly Cinemas is New Zealand’s only Drive-In Movie Cinema! Founded in November 2013, Firefly Cinemas held a very successful and buzzing first summer season at Trentham Racecourse through to April 2014. Over the past 3 years, it has continued to grow and has a large following of fans and supporters. We are now taking our product and service to the whole of Aotearoa, and wanting all of New Zealand to experience the joy of an outdoor drive-in movie. With over 5000 people attending last summer, you can be sure your advertising is reaching a large, engaged and very readable target market – but this is only just the beginning of our investment options. Firefly Cinemas has a huge range of advertising and sponsorship opportunities – unparalleled in value and uniqueness – with something to suit every budget. Ready to advertise? Read our spec sheet here. Special offers to ticket holders, who can redeem directly from you with their ticket to help monitor your ROI. Premium programming showing first-run movies. Fully accountable audience measurement system. Exclusively claim naming rights & Firefly’s exposure becomes advertising for you! Display any brand advertising at the events eg. flags, vehicles etc. AND claim every unique advertising avenue we have – in generous helpings! Double one minute commercial spot before and after every screening – with free one-off professional video production! Marketing collateral handed out before every screening – flyers, complimentary/discount coupons etc. Exclusive “tower” display banner on homepage of the website – including free professional design, updated monthly! Ten complimentary car tickets to every Firefly screening – great for client gifts or staff incentives! More advertising options available in our media kit! Let our graphic design team design your advert for you. Simply provide the content, wording, logos & photos – and we will design something eye catching. There is a one-time fee to create your advert, however if you purchase 5 sessions or more – this will be free. Want to create a 30 second advert showcasing your business? We have teamed up with Brady Dyer Photography to provide low-cost high-quality videos for your business. For $2,000 our marketing team will work with your business to develop a professional 30 second advert which we will display in your allocated slot, and you will be free to use on any other platforms. All prices are in NZD & Exclude GST.